We’ve known that Quentin Tarantino‘s upcoming project, The Hateful Eight, would be a return to the western genre. The film would of course see familiar faces in Tarantino films like Samuel L. Jackson, Michael Madson, Tim Roth, Bruce Dern, Kurt Russell, and Walton Goggins,, as well as some fresh faces like Jennifer Jason Leigh. 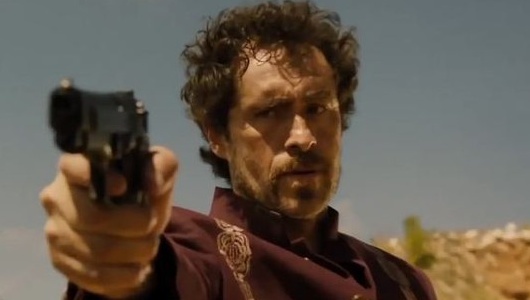 Now there are confirmed reports that Channing Tatum and Demian Bichir (FX’s The Bridge) are also joining the cast. The Weinstein Company also revealed an updated version of the film synopsis. Hit the jump to learn more. While Tatum is big name talent for a Tarantino film, according to Deadline, he won’t have a huge role in it. However, according to the press release, Bichir will have a vital role as someone who is taking care of a stagecoach stopover while the owner is out visiting her mother. A stagecoach hurtles through the wintry Wyoming landscape. The passengers, bounty hunter John Ruth (Russell) and his fugitive Daisy Domergue (Leigh), race towards the town of Red Rock where Ruth, known in these parts as “The Hangman,” will bring Domergue to justice. Along the road, they encounter two strangers: Major Marquis Warren (Jackson), a former Union soldier-turned-infamous bounty hunter, and Chris Mannix (Goggins), a Southern renegade who claims to be the town’s new sheriff. Losing their lead on the blizzard, Ruth, Domergue, Warren and Mannix seek refuge at Minnie’s Haberdashery, a stagecoach stopover on a mountain pass. When they arrive at Minnie’s, they are greeted not by the proprietor but by four unfamiliar faces: Bob (Bichir), who’s taking care of Minnie’s while she’s visiting her mother, is holed up with Oswaldo Mobray (Roth), the hangman of Red Rock, cow-puncher Joe Gage (Madsen), and Confederate Gen. Sanford Smithers (Dern). As the storm overtakes the mountainside stopover, the eight travelers come to learn they may not make it to Red Rock after all. A very intriguing premise, filled with a promising cast. After the script was leaked earlier this year, Tarantino treated fans to a live-read of an early draft of The Hateful Eight, which was read by a majority of the current cast. So how much was changed from then to now remains to be seen. Filming is scheduled to begin early next year in Telluride. The Weinstein Company is eying a 2015 release.